Born in Lakeland, Florida, Dr. Eric Webb graduated at Florida State University with a Bachelor of Science degree in Biochemistry. He graduated medical school with clinical honors at the University of Alabama, Birmingham. He trained in obstetrics and gynecology at the University of Mississippi Medical Center. He is board certified in Obstetrics and Gynecology and is also credentialed in Advanced Laparoscopy by the AAGL. 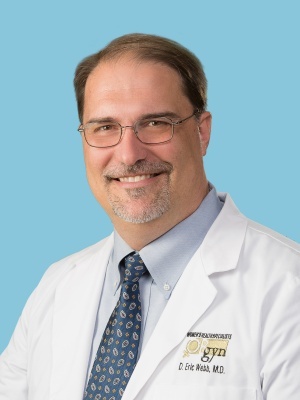 He is a published researcher and has been honored to receive the “Physician Recognition Award” by the American Medical Association and the “Special Excellence in Endoscopic Procedures” by the AAGL. He served as the first Medical Director in Robotic Surgery for NMMC and currently service as NMMC chair of the Department of Obstetrics, Gynecology and Pediatrics. Dr. Webb is married and the father of four daughters including a set of twins. He is a member of Lawndale Presbyterian Church.